Fresh Pizza, no oven needed! I was craving a pizza, a fresh crispy pizza. None of that frozen stuff they dare call pizza. I wanted the real deal, but sadly I don't own an oven. 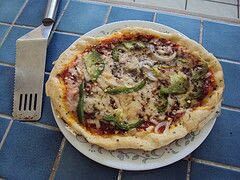 So looked for a way to make a fresh pizza without an oven or a microwave. 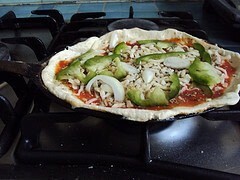 I read somewhere that in India they make pizzas in cast iron skillets. I decided to give it a go and it worked! In a bowl, mix the dry ingredients: flour, baking powder and salt. Add the oil. Gradually add the water while you mix the ingredients, mix until you can form a ball with the mixture. Mixture should not be sticky. 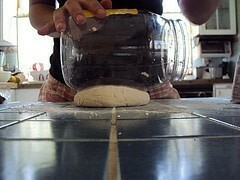 Knead over a floured surface for a few minutes, between 3-4 minutes. Grease your skillet, I suggest using a cast iron skillet because it distributes the heat better, but I sud a non-stick pan and it worked too. You can use whatever you like for greasing, I used PAM Baking spray. 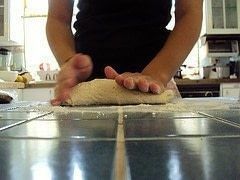 Roll out your dough and place it on the skillet, like a pie crust leaving some crust for the borders. I dont have a roller, so I used a big jar. Now fill your pizza with the ingredients you prefer. 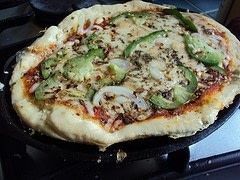 My veggie pizza has tomato sauce, mozzarella cheese, green peppers, onions, a bit of grated Parmesan cheese and parsley. 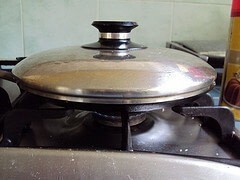 Place on the stove in low heat, you want the cheese to melt and the veggies to soften before the crust gets toasted. 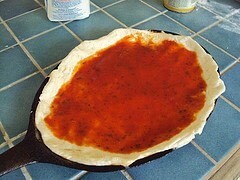 Cover your pizza and let cook from 10 to 20 minutes depending on the thickness of your crust. Mine were pretty thin so it took about 10 minutes. I brushed a little of butter on the crust that showed on the top so it would look more golden. Now that it's done, just take out of the fire, slice and enjoy! can you use store bought dough if you're too lazy to make your own? Jamie Oliver did a version of this in his '30 minute meals' series - he did this and like three salads and a dead easy dessert in 30 mins. but he mixes the dough in a food processor and makes the pizza into a frying pan, makes a simple sauce and then adds mozzarella, salami, chilli and basil on top and then sticks it under the grill (because it's available) and cause he scrunches up the salami it goes super crisp. It means it only take like 5/10 mins max to make a whole pizza from scratch. He has a book online but you can probably find the videos on youtube. Great idea for the summer when you don't want to turn on the oven! Thank you so much for the idea! I tried this yesterday and it teasted fantastic! Just awsome - even better than made in the oven!^^ Fave! Great! I want to see it! i just made it!!! i'll post a version soon! Oh my Gosh! This is amazing! I can't wait to try this! Thanks for the awesome idea! awesome! it was featured, I knew it would be, it's great. I'm posting my version now, I've made the pizza some days ago, but i've been too lazy to post it.